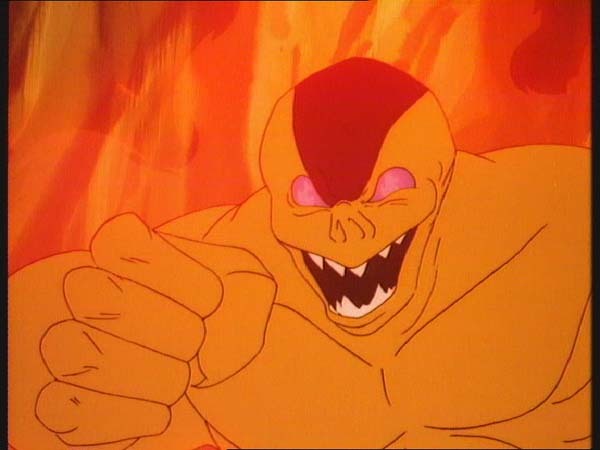 The concluding trial in LION-O’s Anointment Trials, a series of tests each of the LORD of the THUNDERCATS has had to pass in order to prove himself worthy of his inherited title, pits him against the evil MUMM-RA. In this trial, LION-0 must face MUMM-RA alone, without the aid of the other THUNDERCATS and without the Sword of Omens. JAGA appears and offers LION-0 advice, but LION-0 decides to go his own way. MUMM-RA summons the MUTANTS and commands them to destroy LION-0 before he gets to the pyramid. The MUTANTS attack him and trap him in an underground pit, which is similar to MUMM-RA’s pyramid. While underground, LION-0 encounters and overcomes many of MUMM-RA’s obstacles; a faceless BOATMAN; a living ceiling; a huge, one-eyed cocoon; the INFLAMER. LION-0 finally reaches MUMM-RA’s pyramid and engages in battle one-on-one with MUMM-RA. During the battle, LION-0 realizes that MUMM-RA’s sarcophagus is the source of his regenerating power. LION-0 hurls the sarcophagus into the boiling Cauldron. MUMM-RA turns to ashes. JAGA appears again and praises LION-0 for his heroism and bravery. LION-0 vindicates his own plans by defeating MUMM-RA, thus proving that he is indeed worthy of his inherited title. The Anointment Trials of Lion-O climax in his confrontation with Mumm-Ra himself. Having survived the earlier trials presented by the ThunderCats, he enters into his final trial equipped with his heroic qualities of strength, courage, cunning, and wisdom. 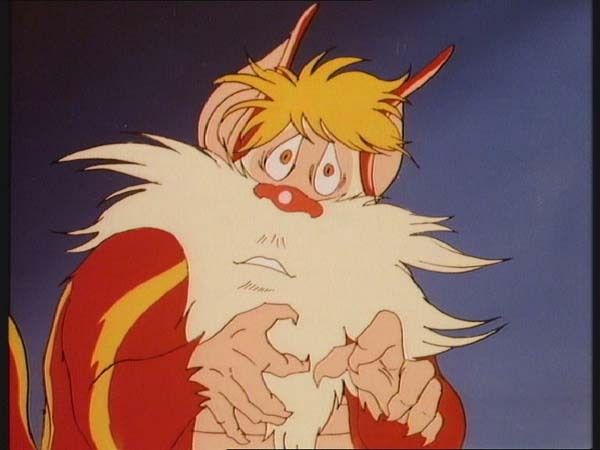 Realizing he must face Mumm-Ra alone and having been prepared accordingly, he refuses Jaga’s offer of advice and resolves to rely independently on his own inner strength and ability. 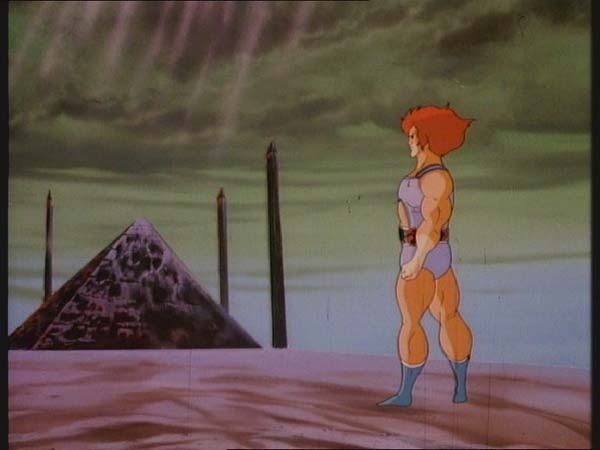 Entering into the realm of wondrous forces and powers, Lion-O endures until he finds he understands the source of Mumm-Ra’s power, his sarcophagus. Destroying the sarcophagus, Lion-0 vanquishes Mumm-Ra and by winning his final trial is anointed Lord of the ThunderCats. As a hero destined to become Lord of the ThunderCats, Lion-O did not shirk from the responsibility to grow in self-awareness, in the development of his character and abilities, and in the courage and willingness to use them for the betterment of others. We too bear a similar responsibility and can learn from the example of Lion-O. We have our own abilities and talents that we must seek to understand, cultivate, and express. We should do so in the spirit of courage and prudence. Often it is our own inner fears and emotions that block our development, create inhibitions, and seem to overwhelm us. By facing our fears and our inner world of emotions, by sharing them prudently with adults and friends we trust, we grow in understanding ourselves. And by responsibility using our talents and abilities in our lives we become, like Lion-O, as essential member of our community. If the five episodes that comprise Lion­O’s Anointment Trials have a single thread running through them, it’s that heritage and tradition are vitally important to the ThunderCats. Stranded on Third Earth, it’s not difficult to imagine that that heritage and tradition are like lifelines to them, strands of their homeworld that they cling to in order to retain their own identity on their adopted planet. It’s not hard either to believe that it’s this sense of heritage and tradition that drives them to enact the ritual of the Anointment Trials even when the setting from which these trials originated, namely the planet Thundera, has long been obliterated. This episode, the final of the five, is perhaps the most stark illustration of how committed all the ThunderCats are to the concept and ideal of the Trials, as Lion­O faces his deadliest foe completely unarmed. The reason it’s not hard to come to the conclusion that tradition and heritage are what motivate the ThunderCats to carry out the Trials on Third Earth is primarily because, on their adopted planet, the Trials serve very little practical purpose – or at least, carry far more risk than reward. On Thundera, one can imagine why the Trials could serve as an important ritual – for, on Thundera, the Lord of the ThunderCats would rule over a massive number of Thunderians, in much the same way as Claud­Us, Lion­O’s father, did. In that circumstance, with the rule of the planet and its population being a hereditary position, one can understand why the fitness of the heir apparent to rule needed to be justified – it could be argued that the Trials would take the place of an election or some other such democratic process, ensuring that whoever lead the Thunderians was fully qualified to do so. By contrast, on Third Earth at the time of the Trials, all of the ThunderCats have had a close personal relationship with Lion­O, and should, on paper, be aware of his fitness to lead them (or not). 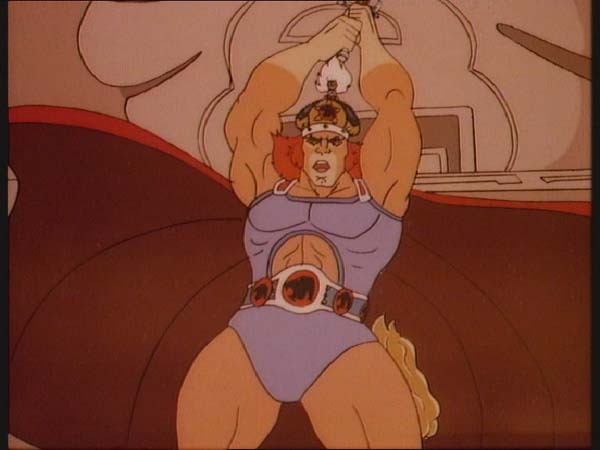 Perhaps the most jarring thing about the Trials is how much of a risk the ThunderCats take by acting them out – for, over the course of the preceding episodes, we see the ThunderCats rely heavily on Lion­O, and also on the Sword of Omens that he wields not because it’s his but because he is leader. For Lion­O to fail the Trials would leave the ThunderCats leaderless, and without a champion to call upon the power of the Eye of Thundera, leaving them potentially at the mercy of their enemies. 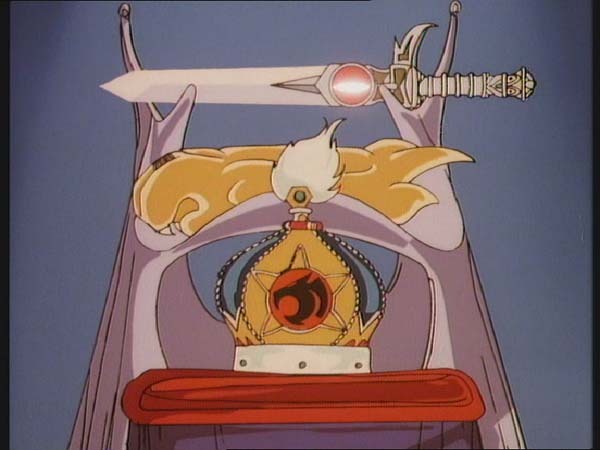 Whilst it’s not hard to imagine that the ThunderCats would have contingency plans within their traditions should the hereditary lord fail to complete the Trials, nonetheless the period of flux and confusion that this would create within the ThunderCat ranks would leave them vulnerable and at the mercy of their enemies. To this end, it could be argued that this point is never illustrated more starkly than in this episode, where the ThunderCats call upon Lion­O to confront head on his deadliest foe in unarmed combat and defeat him in order to complete the Trials. Again, on Thundera it’s easy to understand how this came to be, one of the requirements of a leader would be to protect the planet and its people, the majority of whom would be simple civilians. However, on Third Earth it’s difficult to see what the ThunderCats could stand to gain by Lion­O heading on this potential suicide mission, attacking someone significantly more powerful than he (for, on Thundera, it’s unlikely that a ThunderCat lord would have had to face a foe more powerful than a Mutant) – indeed, the greater risk is that their present leader, whom they all care about and rely upon, will be killed by Mumm­Ra, thus not just failing the Trials but dying in the process. Again, this is further illustration of why it is heritage more than any practical purpose that motivates the ThunderCats in their desire to see the Trials through to the bitter end. As to the episode itself, once again, as is so often the case with episodes originating from the pen of Leonard Starr, it is a brilliantly engaging and entertaining adventure story that leaves the audience on the edge of their seat. 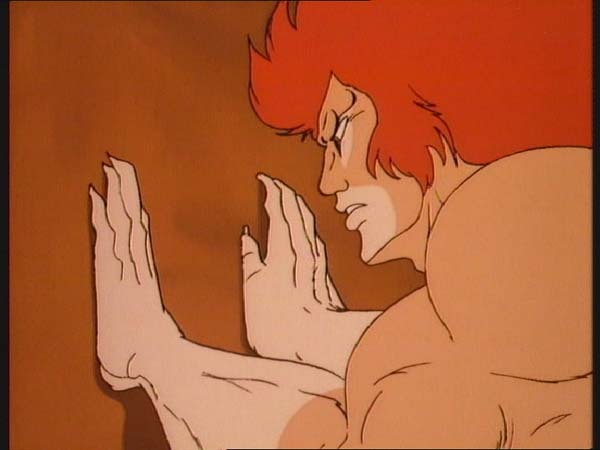 One of the most noteworthy aspects of this episode is how graphic the demons and devils are that Lion-O has to face – whereas in other animated series from this period and genre the threats that the main hero would have to face would be somewhat watered down out of consideration for the show’s young audience, this episode pulls no punches, with many fearsome creatures being faced down by Lion­O en route to his showdown confrontation with Mumm­Ra. If this episode has a weakness, it would be that the style of animation rather lets down the powerful and dramatic story – with rather angular, slightly cruder rendering, the animation for this episode seems hurried and parts of it were likely outsourced to less expensive studios. It lacks the detailing that is so much an intrinsic part of Japanese anime. Yes, it could be worse, but sadly it is not up to the high standard set by many of the series’ other episodes, and it’s a shame that such a beautifully written episode does not have better visuals to back it up. One other interesting element of this episode is Lion­O’s interaction with Jaga. When he speaks to Jaga at the beginning of the episode Lion­O actually speaks wisdom about trying to deal with the forthcoming Trial on his own, for if he is truly to be Lord of the ThunderCats this is what he has to do. This is mature and perceptive of Lion­O, for if he were to follow Jaga’s advice all throughout it would not be just he who had completed the Trial, but Jaga as well. Interestingly, when Lion­O says this to Jaga, Jaga almost seems to take offence, which is somewhat out­of­character. However, at the episode’s conclusion, this is resolved, and the closing scene between Lion­O and Jaga is a beautiful character moment that very much sets the tone for their relationship throughout the rest of the series. Whilst this episode isn’t completely perfect, it’s nonetheless a powerful and thoroughly entertaining installment – with the whole Anointment Trials arc something of a fan favourite, this episode stands out from several of the others to provide a very satisfying conclusion to the tale that showed Lion­O emerge from boy to man. 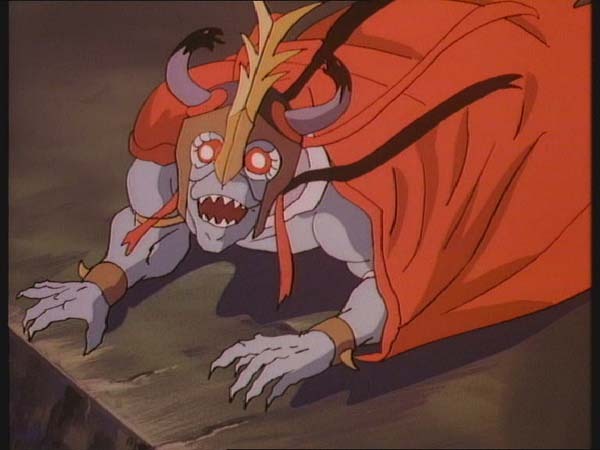 In this episode, Maftet refers to Mumm­Ra as “the Devil Priest”. 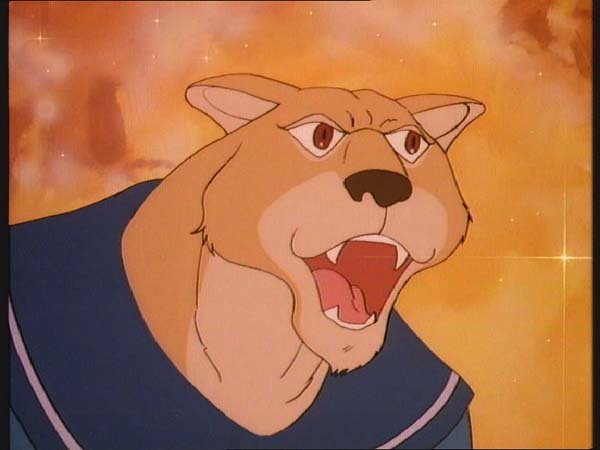 Although the ThunderCats’ primary adversary would regularly by referred to by this term in other media, this marks one of the rare occasions that the term is used in the series itself. When Lion­O is fighting his way towards the Black Pyramid he’s attacked by a creature that uses the exact same character model as the Inflamer from “All That Glitters”, both in his flaming form and when his flames are extinguished! 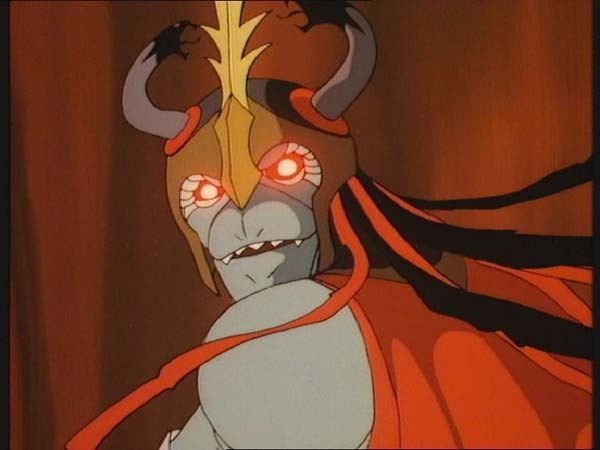 When Lion­O is nearing the Black Pyramid, Mumm­Ra reacts emotionally to the thought of the ThunderCat leader penetrating his stronghold as though it has never happened before. 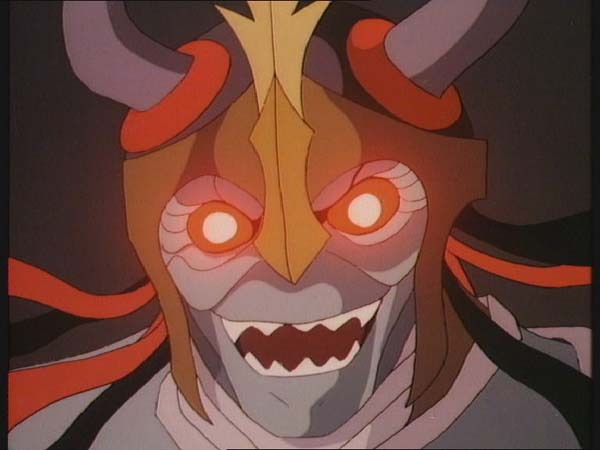 In fact, at this point in the series Lion­O had been inside Mumm­Ra’s tomb chamber on more than one occasion, notably in “Snarf Takes Up the Challenge” and “Dimension Doom” – however, it could be argued that on both of those occasions, the young lord was at Mumm­Ra’s mercy, a rather different scenario than in this episode! In this episode, it’s revealed that Mumm­Ra’s Sarcophagus is the source of his power. When Lion­O defeats Mumm­Ra, the devil priest is graphically shown to die, indicating that he is defeated for good. When his resurrection is hinted at in the final scene of this episode, the scene showing this looks somewhat as though it was edited on at the last minute, indicating that perhaps this episode had been penned as a finale of sorts, but that the writers subsequently changed their minds. When Lion­O is crowned as Lord of the ThunderCats, a crowd is pictured outside Cats Lair in a panning shot. 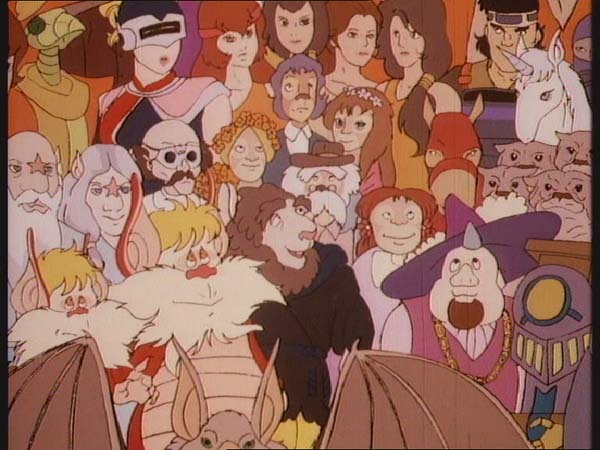 Amongst the more unusual characters to appear in this crowd scene are Quickpic (from “Mandora – The Evil Chaser” and “Mandora and the Pirates”), Mule (from “Safari Joe”), the Trollogs (from “Berbils”), an incorrectly coloured Dr. Dometone (from the episode of the same name), and, most bizarrely of all, the evil Ninja from “The Thunder­Cutter”! 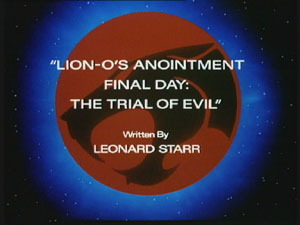 Although he would write all of the first ten episodes of ThunderCats’ season 2, this episode is the last that Leonard Starr would contribute to the first season. Even though all of the episodes that comprise Lion­O’s Anointment Trials are spaced apart, they are written as taking place on consecutive days and as such are designed to be watched together. 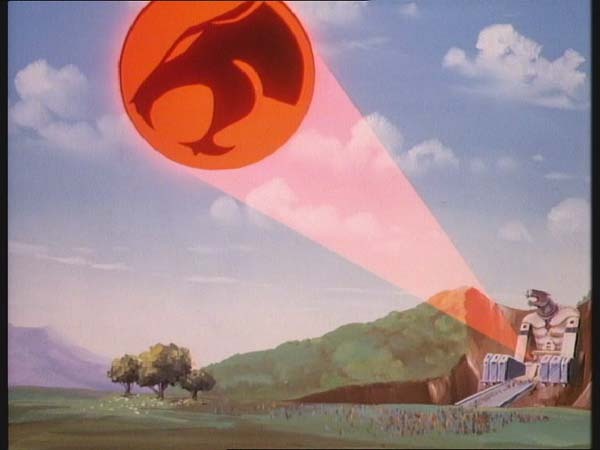 When ThunderCats was shown in the UK on the BBC, it was common practice for one episode of the show to be broadcast once a week, unlike in the US where many stations would broadcast the show daily. As opposed to in the US, where the Anointment Trials episodes were spaced apart, in the UK they were shown together, with the five parts being broadcast over the space of five weeks. These episodes were not broadcast in the UK until September 1990, where they kicked­off a new series (season) of ThunderCats ­ the new season in question being the latter half of season 1! Interestingly, even though the Anointment Trials episodes had not been broadcast in the UK until that time, several episodes that appear after them in both production and US airdate order had been broadcast on the BBC several years earlier.